Millennium 7 Publishing Co.: Social Media Marketing Mistakes To Avoid In 2018? 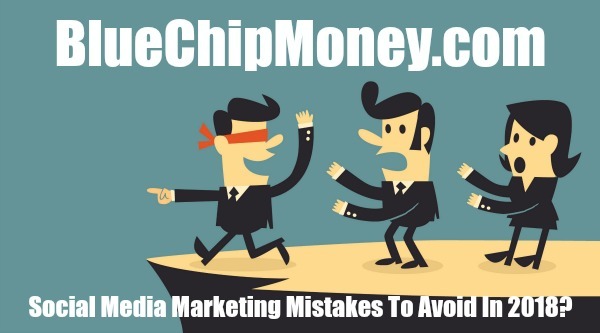 Social Media Marketing Mistakes To Avoid In 2018? Most companies have social media marketing teams, strategies, and eventual goals. Yet, many don't understand how these best tie in to existing business goals..
Related Article: Marketing Trends That WILL Shape YOUR 2018? Any company that uses the Internet to drive business will engage in social media marketing. However, many businesses incorporated social media after their businesses reputation and goals were established. This can force a business to reconsider their overall business strategy. Avoid this in 2018 by dodging these three basic social media marketing mistakes. According to eMarketer, almost 90% of U.S. companies are using social media marketing in their business strategies. Despite that, most companies use social media platforms as an add-on to existing marketing strategies. Instead of crafting a strategy for social media marketing in general and for each platform individually, companies often use social media merely as a new medium to spread an existing marketing message. Many companies then work in reverse to link relevant social strategies to business strategies. This allows them to prove the ROI of the marketing plan with greater clarity. Nevertheless, a CMO survey shows that nearly half of these businesses' marketing teams are incapable of detailing the specific returns of their social media marketing investment. Another way marketers lose focus is by getting trapped in the social-media gratification loop. On a given platform, marketers look to gather large numbers of likes, comments, followers, and shares. These numbers look great during presentations, but what do they actually mean? If you can't quantify the value of a high number of followers, chances are your social media goals aren't correlating to specific business goals. In order to understand the ROI of every social media marketing strategy, you have to be sure to connect overarching business strategies to social media marketing strategies from the very beginning. Depending on the size and scale of your business, it's important to create a social media presence across the entire company. These days, each department will need to be aware of social media and its ability to expand the scope of any sector. In order to keep standards across departments, you might even need a dedicated social media management team. As we've included in pretty much every digital marketing post we've ever made, you must use a robust analytics platform to gauge, study, and improve your marketing strategies. Google Analytics, for example, can give you web traffic numbers broken down by age and geographical demographics, time of day, conversion statistics, bounce rate, and types of devices used to access your page. This information gives you the ability to see what's working and what's not. It will tell you what domains and social media platforms are bringing you the most intention a-telltale sign of where you need to invest more time and effort. Another common mistake social media marketers make is limiting the brand's social media real estate to only the most widely used platforms. While having a presence on many social media platforms increases authority, perception of authority, and overall marketing success, only two-thirds of the top companies are using YouTube. The numbers are even lower for fast-growing platforms like Instagram (under 50%). These numbers are from 2016, but from the chart below you can see that not much has changed since then. Failing to represent your company on every available social media platform could potentially cause you to miss out on business opportunities. Consider this: if your business wants to increase its marketing reach to the Millennial generation, but it's not using Snapchat, it's missing the mark. What social media marketing strategies has your business implemented? Have you ever had to restart a marketing campaign to better understand ROI? Guest Authored By William McKinney. William is a Writer for Edgy Labs, an English Teacher, a card carrying Nerd, and he may run for President in 2020. Follow William on Twitter. Related Article: Social Media Mistakes YOUR Company Makes? "No matter what industry you belong to, what size your company is, what products or services you sell or how knowledgeable you are with upcoming trends, you always have to put your best foot forward.